Urbana’s Marion Krebehenne works the ball up the floor against tight defense on Tuesday versus visiting Bellefontaine. Urbana defeated visiting Bellefontaine, 49-45, in CBC non-divisional boys basketball on Tuesday. The game was close throughout, with a cold Chieftains’ team failing to score in the first four minutes. However, Bellefontaine scored at both first-half buzzers and trailed only 21-18 at the intermission. The second half saw Urbana (8-7) stretch the lead out to seven points midway through the third quarter, but the rivalry and history between the teams dictated a comeback from the visitors. It happened with Jack Clement, who scored 19 points for the Chiefs. “Clement is a really good player. 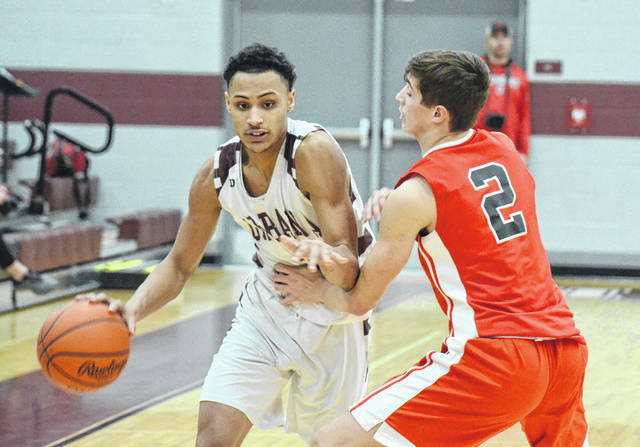 He’s tough to guard and he not only makes shots, he makes the right decisions all the time,” UHS Coach Jeremy Dixon said. The teams traded the lead as the third quarter wound down, with Urbana holding a 32-31 lead heading into the fourth. Down the stretch, the game was tied at the 4:00 mark. Several Hillclimbers made big plays, with Marion Krebehenne playing like a man possessed for about a 90-second stretch. Krebehenne, at the top of the 1-3-1 zone defense, snagged a couple of steals and offensive rebounds and finished with 11 points. Reid Taylor scored 10 points and Isaiah Fonseca led the team in scoring with 14 in his return from injury, but was only 6-of-14 from the line and 4-of-12 in the fourth quarter. Urbana was in the bonus with 2:30 left in the game, and led by 8 with 1:45 remaining on the clock. Bellefontaine (4-11) actually trimmed the lead to two with 15 seconds left and got possession off the inbound with a jump ball, but failed to convert and watched as Fonseca put the nail in the coffin with a pair of free throws and just two-tenths of a second on the scoreboard. In the jayvee game, Bellefontaine won, 58-43. For Urbana, Izaiah Underwood had 14 points and Nolan Smith added 12. Urbana’s freshmen lost their contest, 46-33, to Fairbanks. So how does the UHS program need to continue to grow after a big rivalry win? Urbana plays at Graham on Friday. https://www.urbanacitizen.com/wp-content/uploads/sites/36/2019/02/web1_MarionKrebehenne012919_ne201912920274944.jpgUrbana’s Marion Krebehenne works the ball up the floor against tight defense on Tuesday versus visiting Bellefontaine.